Liverpool loanee Taiwo Awoniyi will not be available for selection when Royal Excel Mouscron play their next two competitive matches following the red card he picked up against Lokeren last weekend. According to Belgian Football, the Nigeria U23 star has been banned for three match days by the Royal Belgian Football Association (KBVB), of which two are effective, and fined 800 euros (about N350,000). Awoniyi was shown a straight red card by referee Nathan Verboomen for elbowing Lokeren's Monsecour, which led to the defender bleeding on the nose. The incident happened around the 74th minute of the game staged at Stade Le Canonnier (Mouscron). The 20-year-old will miss Royal Excel Mouscron's last game of the regular season against AS Eupen plus their first game in the playoffs if the decision is not contested. 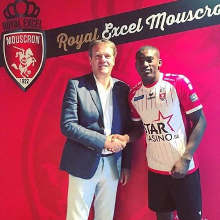 The incident on March 3 has cast a blight on Awoniyi's outstanding season for Mouscron, he is their joint-leading scorer in the Belgian First Division A with seven goals from 27 appearances.